As you will notice by the image above a Gondola provides the ability to display merchandice or products on both sided of the display. Upper shelves can be placed a different increments on either side of the Lozier Gondola. The most popular heights for a double sided gondola is typically from 48 inches high to 60 inches high. 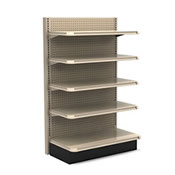 The reason these heights are so popular is: the store clerk or cashier can see of the display. Lozier Gondolas are available in standard heights from 36 inches high to 96 inches high. Extended heights are available by either special order or more comonly with the use of what are known as upright extensions and extended back boards. The standard widths are 36 inches wide and 48 inches wide. We have widths of 30 inches wide and 24 inches wide available by special order. What is unique about Lozier Shelving is they can be connected together to creat an isle of gondola at almost any length. 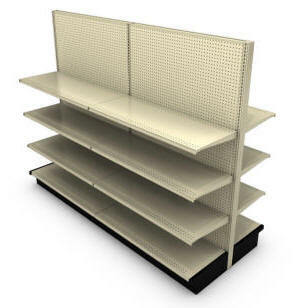 We have base and upper shelving available in all of the widths listed above and depths from 10 inches deep to 30 inches deep. Typically configured with a single sided wall gondola. The wall gondola can be placed right up against an existing Lozier Gondola. An additional back board will need to be installed as the back of the shelving unit will be visable. We also have what are known as end frames if so desired.